Would you like to receive exciting information & news from Portable Electric? Portable Electric’s VOLTstack power stations deliver reliable, instant power whenever and wherever you need it. 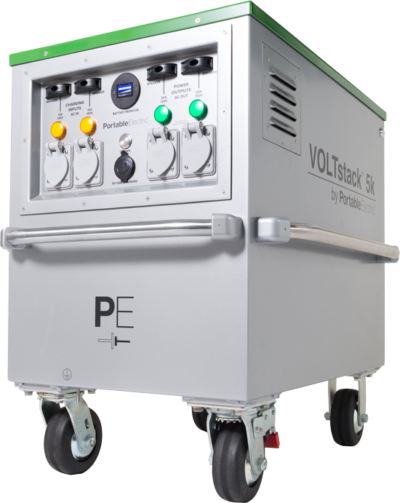 The VOLTstack is a battery electric generator – no fumes, no noise and no excessive costs. Simply flip a switch for silent, emissions-free portable power. No matter the need, the VOLTstack is revolutionizing the way we power our world. Capable of replacing your gas/diesel generator, the VOLTstack will change the way you use power – forever. Keep reading to learn more about the future of power, today. The most robust, reliable and fast charging power stations in the world. Portable plug and play power. Charges in 2.5 hours. Solar PV charging capable. Full wireless monitoring and data collection. Long-life, 10 – 15 year / 5000+ cycle lithium ion batteries. Unrestricted site design – plan your set, event or build site around what works, not your power demands. Each unit charges in 2.5 hours, empty to full. With a 5000+ cycle battery life, VOLTstack units have a 10 – 15 year lifetime range when used daily. Wireless real-time energy management delivers data-driven decision making and GPS services. No harmful emissions – reduce your carbon footprint and enable flexible indoor/outdoor operations. Zero fuel costs, zero moving parts and zero maintenance requirements. Completely silent power means longer operating hours, no expensive cabling and clearer sound. Portable Electric & Amazon’s, “Man In The High Castle” series brought our resources & mutual interests together to see how we could best integrate clean energy into film & television & to mitigate using solely diesel power generation. The ideal was to reduce our carbon footprint, fuel costs, noise disturbances etc. It has been an excellent learning & development process for both of us and we are really happy with the results. The 5K proved useful in powering daylight splinter units, DIT downloading after camera wrap, dollies, techno 15, sound cart, short durations at crafty or catering truck etc. The 13K was great for daylight scenes, or powering cranes & gear on water barges, big daylight establishers, downtown areas where generator placement was prohibited. Next season we’d opt to lease 2-3 of the 5k units and rent the 13k on a daily or episodic basis. Looking forward to making film & television a more sustainable, green & clean industry. First we plugged one light in, checked the voltage on it, it was fine. And then we plugged in two, then we plugged in three and we ended up using eight lights. The 13k sat in the snow for three days and it never died on us once. I realize when I’m on a survey that I’ve got Portable Electric in my back pocket. For confined spaces, locations where you can’t cable, places with noise restrictions, these make total sense. Portable Electric is what everybody needs, whether they know it or not, and it’s the way the world is going. With the continued growth of our industry, more and more neighborhoods/areas are being compromised by the usual noise and air pollution created by film sets. The public are getting tired of us. What if productions were able to offset that noise with silent electric generators and no exhaust fumes? The applications on set are endless. The reduction in noise and air pollution are huge. VOLTstacks are an amazing power option and we look forward to using them again soon. The Portable Electric generator was an invaluable addition to our gear on ExtraOrdinary Amy. The advantage we had shooting with an electric generator was that it made no noise, so we were actually able to use it as late as we needed without bothering neighbors. We needed a lot of power, we had a large crew with several stations for Village, DIT, Video Playback, and we had large spaces we needed to light. The generator worked reliably and on one charge powered us for almost 2 days. I hope we can power all our sets with Portable Electric! Portable Electric was the perfect fit. Instead of towing a trailer we were able to bring a VOLTstack Power Station onboard [the bus]. This was a huge benefit to us, as we were able to work with the City of Vancouver to avoid costly police liaison and escorts during filming which would have been prohibitive for our shoot. Aside from saving us money, we were able to keep power close to set without compromising sound and covering everyone with the usual exhaust cloud. Using silent electric power saved us a number of headaches. Having the power station right beside set meant I could manage this project with very little help and save money. Because noisy gas or diesel options need to be hundreds of feet away before the sound man stops complaining, you often need an extra person who can babysit the unit, keep it topped up and check the lines if something goes wrong. I managed this entire project with only one other LX crew member, and I was never more than a few steps from set. Portable Electric gave the Vancouver International Soccer Festival the power to choose clean, renewable energy. I am thrilled they are operating in Vancouver and impressed at the capability of their battery systems. We will certainly get them to power our entire event next year! I have been looking for this type of solution that Portable Electric offers for some time. I was always thinking that the noisy, smelly gas powered generators were taking away from our events. Portable Electric delivered exactly what they said they would – clean portable power that worked. We were excited to Welcome Portable Electric to help power our Blessed Coast Festival this year and in doing so, we were blown away! The level of stewardship the team holds over this incredible technology made the difference in smoothly running our sound and lighting off silent, renewable energy. It was a miracle we had only dreamed of years ago. Portable Electric is about to change the way festivals sound and smell forever. The inaugural Vancouver Mural Festival launched with 80,000 people celebrating on Main Street and one of the best parts of the event was the “festival staple” that was missing: stinky gas generators and rumbling motors behind every stage and food cart. Instead: quiet, clean power! We look forward to the impending festival power revolution. Portable Electric is the perfect replacement for a noisy gas generator. Working with gas generators outdoors has always been an issue trying to keep the stage volume above their noise. VOLTstacks are great in these situations as they produce no noise. Once the show is up and running you no longer notice they are there. I would highly recommend Portable Electric to anyone or business needing power supplies for outdoor events and concerts.